Nemo is perhaps the most well crafted of all the sims on my list. Everything from the fine textures to the tiny detailing. Sextan Shepherd built this Jules Verne inspired world and guess what he does for a living? Painter? Sculptor? Designer? Illustrator? no no no silly, he is a financial reporter for a magazine. Sextan really does embody the premise behind having a second life. Financial reporter by day and creator of fine steampunk by night. You can see sextan's passion for steampunk in virtually everything on the sim. He didn't rush though a single portion of the work and the whole build is planned out quite well. It has some areas of emptiness and some full of activity, a really nice balance to keep the viewer interested. Often in a work of art the artist will have an area in the work which is quite detailed with information or varied colour or line. An area which is dynamic and busy. If an entire work is created this same way then the viewer will lose some interest because the creation will become somewhat monotonous. This applies to everything from subject matter to brush stroke etc. What the artist does in this case is to create areas of tranquility for the viewer to "relax" in. So if it were a painting we were talking about then the artist might have an area in the painting of say people fighting in the civil war. Some people shooting each other and perhaps an explosion or two. The brush strokes might be wild and thick, very dramatic to show chaos. If the whole painting were done this way then it would actually lose some of its dramatic nature. The artist might create a space beside all the fighting which was a green field with very few brush strokes etc. A place of tranquility for the eye to rest in. Then when the eye moves on from this spot to another area of chaos it becomes dramatic again due to the contrast. Sextan's Nemo is composed very much like this. Large areas of calm water juxtaposed against whirling gears and towers. A really wonderful sim. And I believe there is a new Nemo coming out soon too. #4 from 2009 - Selavy Oh "State of Formation"
#4 from 2008 - AM Radio "The Far Away"
A few months ago I was informed that I had been nominated for an award from BOSL (Best of Second Life). The category is for Best original artist and tomorrow is the event. I am in a category with a bunch of great artists who you can see below. The Best of Second Life is pretty interesting actually (I did some research after I was nominated). Frolic Mills came into Second Life and built up an empire over the course of a few years. Included in this empire you can find THE BEST OF SL MAGAZINE,BOULEVARD MODEL AGENCY, MISS/MR VIRTUAL WORLD ORGANIZATION, THEBOSL.COM, THE FROLIC MILLS SHOW (in partnership with Metaverse TV), BOSLRADIO.COM and the BOSL AWARDS. That's a ton of work running all that and he no doubt has a small army of helpers as well. He could be in some of those categories himself really. Persia Bravin was kind enough to send me the info below. "These awards have been created to celebrate the work of content creators from all genres and all nominees were decided by press members, experienced gamers in each field and content creators themselves. No public voting was accepted. 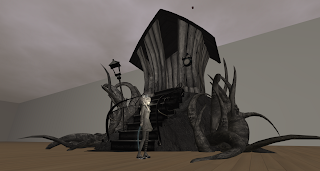 ‘The Best Of Second Life’ is owned by Frolic Mills and has grown to become one of the largest and most respected businesses within Second Life. BOSL and Frolic are also the creators of the Miss Virtual World contest which attracts participants from across the grid. In 2010, over 2,000 entries were received and in December 2010, the current reigning MVW - Serene Faith- was crowned. Broadcast via Metaverse TV, the final attracted over 2,500 viewers and the BOSL Awards is anticipated to gain even higher viewing statistics. In April 2010, BOSL radio was launched to help promote grid wide events, creative talent and to showcase the talent of SL residents. In its first year, BOSL Radio had over 500 guests, broadcast from some groundbreaking events (including RL movie Director Peter Greenway’s speech at a machinima convention) and has assisted dozens of charities to help promote their fundraising objectives." So now I am going to pick my winners just for fun. Some of the categories I know nothing at all about. I have decided to remove a bunch of categories because it was taking me forever to scroll down my blog post. They will no doubt get lots of recognition on fashion sites so I am only doing a mild disservice to them. Oh this is a tight one. I would choose between either DB Bailey or Keystone bouchard. In the end though I would pick DB Bailey as his creations really embrace the concept that architecture in a virtual world need not conform to real life rules such as gravity or the need to include stairs when we can fly etc. I shouldn't really vote on this one so I will make an alternate list and vote on that instead. Oh that's a tough list why did I do that to myself? Maybe I should make a third list. Actually no I will just move on to the next category. I think I would pick the UWA Art Challenge or METAVERSE TV. I would go with Skye Galaxy here. Hmmm here I would pick Insilico. This is an intriguing one. My sentimental favorite would be JayJay Zifanwe, but I think really it will be Jessica Lyon for the fantastic Phoenix Viwer. So as you can see I should never be given the power to vote on anything outside of SL art. I have been having a bit of fun with this, but really I think these kinds of things are important to do to create community and a sense of fun in SL. There are quite a few negative bloggers out there who grumble about everything in SL, so Frolic is probably quite aware that there will be moaning about this as well. In the end though its just kind of nice for each of the avatars on this list to know that people have taken notice of what you do and are appreciative. Anyway, the event is as I said on Saturday April 23rd and runs from 10am SL time to around 1pm or so. This is a machinima I have made for the University of Western Australia. They are running a machinima event which had the loose theme of "Journeys". This is my journey. It's kind of a personal take on the theme. There are already quite a few great machinima submitted and with two weeks left until the deadline, there are another dozen or so expected. Click the link above to go have a peek at some of the ones already submitted. I don't really have much to say in this post other than perhaps what I was thinking when I composed the machinima. So I have harped in the past on my interest in creating Immersion for the viewer in my 3D builds. Working on elements ranging from ambient sound and composition and subtle movement to allow the viewer to forget their first life surroundings for a short time as they explore my work. Along a similar line of thought when making this machinima, I was curious as to whether I could create a rhythm with the fading in and out of the poem coupled with the music. If this rhythm might allow the viewer to subconsciously change their rate of breathing to follow the rhythm of the machinima. I started thinking about this because at one point while I was assembling it, I noticed that I was moving my hand subconsciously in a pattern like waves on a shore to follow the rhythm. My own breathing began to mimic the small portion I had created already. I thought to myself "wow thats kind of interesting". Now I am thinking on how I could work with that for my open ended builds in world. Creating true sustainable Immersiva is already very tricky without headsets and such to block out RL. Just too many distractions around your typical computer to let people become fully immersed within the on screen work. But having said that it would be interesting to see if sound and perhaps text combined within an open ended build could bring the viewer to a certain state when viewing a narrative. This is done regularly in cinema, especially in horror movies, but the viewer can not deviate from the sequence of the movie. The film is always the same, with the same viewpoint and same sequence of events and sound. In a virtual world build the viewer is not controlled as they are an active participant rather than an observer. I could set up this experiment in sound only to have the viewer follow completely unexpected routes through my narrative. They decide where they want to look or go, unlike a movie. What I could do is have sound triggered once the viewer enters a certain radius within an area. Hmmm just thought of something else to consider. Maybe the viewer can change their breathing to follow a machinima because they are not required to do anything at that particular point which may hamper their connection. The body can relax and follow the lead of the machinima, but if one were required to use the w,s,a,d keys on the keyboard to navigate and do other similar things at that time, then perhaps that uses too much mental and physical activity to allow the body to relax naturally enough to sync breathing. Anyway, I am starting to ramble a bit, I hope you enjoy the machinima. If you are a small prim builder and wish to showcase your work, then you might like to exhibit with the UWA. Your work must be no larger than 100 prims which can be tricky, but it's a great place to show smaller builds and a fantastic place to find emerging artists. When I was there last I found the work of Rebeca Bashly shown in the picture to the right. Its the kind of work where you can really imagine what a full sim build might look like if she were given space. And that is the strength of the UWA. Rebeca isn't actually an emerging artist as she has been in SL for four years or so, but I mean that the UWA brings together artists who may reside outside of the creators you are familiar with. Jayjay Zinfanwe has been running this event for a few years now originally with Quadrapop Lane, who did a great job, and then more recently with Freewee Ling who is also an integral part of the events success. What is also nice about the UWA is they give away over $1, 000, 000 linden in prizes to prim artists and $500, 000 to machinima artists over the course of a year. Below is a list of groups who bestow awards, and as you can see you would likely find an audience there who might like your particular work of art. What is kind of nice is that in many cases there is no consensus winner. In the last month almost every group that gave out an award picked a different winner. That suggests that with each month it is very competitive in the skill level of the exhibiting artists. My favorite build from this month was (Three little turns and it goes away) by Josiane Sorciere. I was smiling as the ballerina turned inside her jar, but I was sold when she tipped it over and jumped to her death. The short video above shows how it worked from a few different angles. It is a painstaking process to animate in this way and she did an admirable job doing so in a convincing manner. Something animated poorly really jumps out to the viewer, so the fact that you accept the animation as it is plays illustrates that it was done with enough skill to not break our immersion within the little narrative. SL is not very good for animating in this manner. It can be jerky etc. So knowing its limitations is important when choosing a subject. When we see the ballerina dance we know it is mechanical so we allow it to have a certain degree of unrealistic movements. If on the other hand the graceful smooth running of a horse were to be attempted, then the end result would likely fail as it would not have the measure of grace that we would be accustomed to seeing. So Josiane created a narrative, animated it skillfully and chose a subject to animate that worked well within the limitations of zfire or puppeteer. Or whichever animation tool was used. Also in its own way it is a creation which capitalizes on the unique abilities of SL over RL. I don't know if I would say it is not possible to make in real life, but it would certainly be very difficult to do and exceedingly expensive. I always enjoy a build that allows the viewer to see something that they wouldn't come across in RL. The University of Texas San Antonio (UTSA) led by Dr Carmen Fies, SL Art led by Gleman Jun & Sunset Quinnel, CARP led by Josina Burgess & Velazquez Bonetto, Pirats Art Network led by Merlina Rokocoko & Newbab Zsigmond, Odyssey led by Fau Ferdinand & Lizsolo Mathilde, BOSL led by Frolic Mills and Editorial Clarity, Nordan Art led by Flora Nordanskiold and Apmel Goosson, S&S Gallery of Fine Art led by TheDove Rhode, The Workhouse Gallery led by Astarte Haalan, Art Place d-oo-b led by Eifachfilm Vacirca, The Tornado Gallery led by Taralyn Gravois, project Z led by Zachh Cale and UWA with Professor Ted Snell, Chair of the Visual Arts Board of the Australia Council for the Arts as Chair of the UWA judging panel. It is also a very international group who exhibit, artists come from Taiwan, Hungary, Latvia, Russia, Venezuela, Belgium, Mexico, Wales, Canada, the USA, the UK, Uruguay, Scotland,England, Spain, Switzerland, Italy, France, Brazil, Argentina, Chile, Denmark, Holland, Ireland, Northern Ireland, Portugal, Austria, Cuba, Serbia, Tunisia, Germany, Japan, New Zealand and Australia. I joined a rl group about a month ago that is essentially for people trying to figure out what to do with Kinect. Kinect is an Xbox cam addition which captures your body movements and, with some tweaking, can be made to work with other devices. I joined this group because I had an idea about using Kinect with my arts grant. To create a first life space in a gallery where I supply a virtual reality headset for visitors to wear and then try to use kinect to allow for the gallery visitor to move within an environment that I create. I was thinking that to have a gallery visitor put on a headset then, then be required to use a keyboard to navigate (while not being able to see it) would be a bit of an obstacle. So yes I am in this group and we are made up of a few artists, a handful of programmers and some self professed nerds. Each of them are quite accomplished in their own area of expertise. One of them in fact is a five time Maui Tai world champion. Last meeting some of the programmers were talking and I honestly had no idea what they were talking about whatsoever. In fact, and this is no lie, one of them brought up a screen of gobblygook much like that green code from the Matrix movie and they were looking at it and exclaiming over parts of it. I nodded and pretended to know what was going on, but yeah that's a different world. Kinect is fascinating and pretty much Microsoft have pretended that it was hacked with code being leaked but thats kind of strange because they export them with USB connections which seems to be a bit contrary. Everyone has a USB connection. So yes the world is their research and development division. I am going to post kinect things here and there as it may well be the future of how we interact with everything from software to hardware. I don't really know what I am talking about yet, but I will post things that I learn or come across. For example, when you use kinect to capture your movements from the front it sometimes has problems with certain angles. Solution is to place a second kinect behind the subject and then your full range of motion is picked up much easier.